Techno Stamper: Another gift with matching card. 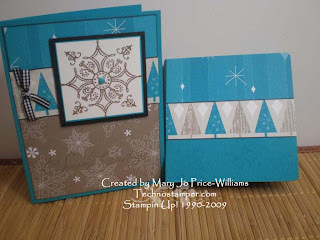 This is for both the Latenightstamper's challenge to make a holiday gift and the SUDSOL sketch challenge for the week. The card is made with the sketch and the note pad holder is inspired by one I seen at school today. Pretty cool to have different size post-its. Don't mind the color of the post its and the pencil. Only ones I had, lol. I made this really quick for a last minute entry to this week's sketch on SUDSOL, the new sketch come out tomorrow. Other: embossing powder (mix of gold and silver), coasters, ribbon, brad, pencil, post-its, marker. Hope you are having a wonderful week so far. Tomorrow is Veteran's Day--don't forget to have your flag hanging! The card is beautiful and the matching post it note holder is fabulous. I love that it holds three different sizes of post it's and a pen. A fabulous teacher's gift or co-worker gift. Thanks for the inspiration!! MJ, I just love your card and the adorable post it note holder. I'd love a post it note holder that held three different size notes!! Great job.